At an event today in the New York City, Motorola unveiled its Moto G7 family for the year 2019. Like the past couple of years, there are not just one or two phones in this lineup as this time, we have a total of four. The Moto G7 family includes the Moto G7, Moto G7 Plus, Moto G7 Power and the Moto G7 Play. Almost everything about each of the phones is already known but still, now that the phones are officially out, let’s talk about each of them in this article. Let’s start with the most expensive of the four and also the most feature packed, the G7 Plus. It is the successor to the last year’s G6 Plus which was an attractive phone due to its glass and metal build. The G7 Plus retains the design from last year as it too has a glass back. The phone has a water repellent design as well (not water resistant). The biggest design change is on the front where the G7 Plus now has a waterdrop notch. Moreover, there is a huge bottom chin as well that houses the Motorola branding. The design from the back remains the same as last year’s G6 Plus except for the fact that the fingerprint scanner is now placed on the rear and not on the front. The phone is powered by the Qualcomm Snapdragon 636 processor which is an octa-core processor clocked at 1.8GHz. We were expecting at least a Snapdragon 660, but that’s not going to happen this year. The G7 Plus comes with 4GB RAM and 64GB storage, and the storage is also expandable up to 512GB via the external micro SD card. One of the best things about the Moto G7 Plus is the 27W Turbocharging which means the G7 Plus is the fastest charging Moto G series phone so far. It can easily beat almost every phone in the same price segment since most of the phones come with 18W Fast charging in this price range. There is a USB Type-C port for charging. As per the company, the phone can get fully charged from 0-100% in just 55 minutes. But, despite having 27W fast charging, the phone has a small 3,000mAh battery. So, it all comes down to software optimization. Talking about the cameras, the Moto G7 Plus has dual rear cameras that include a primary 16MP f/1.7 camera with Optical Image Stabilization (OIS) & 1.22um pixel, along with a 5MP depth sensor. OIS is something that we don’t often see on the budget or mid-range phones, so that’s a sweet addition to the G7 Plus’ camera. Other rear camera features include Digital zoom (up to 8x), Auto HDR, Timer, High res zoom, Auto smile capture, Cinemagraph, All in focus, Portrait mode and more. The rear camera can record 4K 30fps videos, and apart from OIS, there is also EIS. 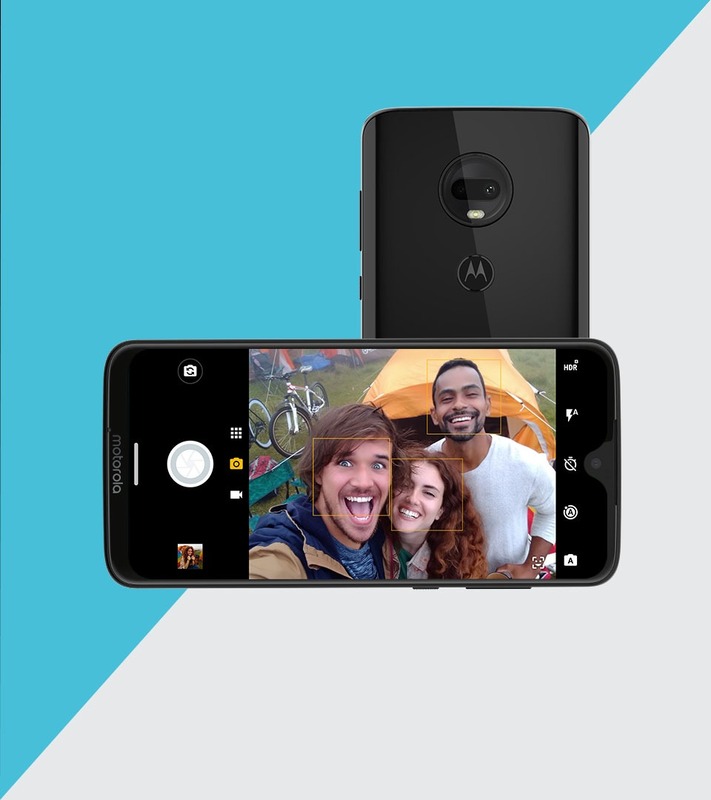 On the front, the Moto G7 Plus packs a 12MP camera with 1.25-micron pixel size and the features include Auto HDR, Face beauty, Auto smile capture, Cinemagraph, Portrait Mode and more. Not to forget that the G7 Plus has stereo speakers tuned by Dolby, so that’s another great addition to the phone. Android 9 Pie runs out of the box with no bloatware at all. Other features include Bluetooth 5.0, Moto Gestures, Moto Display, NFC, 2.4 GHz + 5 GHz WiFi and more. Finally, talking about the pricing of the Moto G7 Plus, it is priced at €300 for the European market and will be available starting mid-Feb. The color options are Deep Indigo & Viva Red. The Moto G7 is the successor to last year’s Moto G6 and looks the same as the G7 Plus. So, there is the same waterdrop notch on the front, 3D Glass back, dual rear camera and a rear-facing fingerprint scanner. So just the internals are different compared to the Moto G7 Plus. The Moto G7 has the same 6.2-inch LTPS LCD panel with a Full-HD+ resolution and 19:9 aspect ratio. It is also protected with the Gorilla Glass 3. The processor is the 1.8GHz Qualcomm Snapdragon 632, which is an upgrade from the Snapdragon 625. The Snapdragon 632 is a big upgrade from the Snapdragon 450 on last year’s Moto G6. The G7 too has 4GB RAM and 64GB ROM & supports micro SD card up to 128GB. There are dual cameras on the Moto G7 as well that include a primary 12MP f/1.8 camera with 1.25um pixel (no OIS) and a 5MP depth sensor. The rear camera can shoot 4K 30fps videos, and there is EIS as well. Some other rear camera features are Digital zoom (up to 8x), Burst shot, Auto HDR, High res zoom, Auto smile capture, Cinemagraph, All in focus, Portrait mode, etc. On the front, the G7 has an 8MP camera with 1.12um pixel size and features like Auto HDR, Face beauty, Auto smile capture, Cinemagraph, Portrait Mode, etc. The battery underneath is a small 3,000mAh unit like the G7 Plus, but the Moto G7 doesn’t have 27W Turbocharging like its bigger brother. It is the 15W Turbocharging which is something we have from a past couple of generations of Moto G. Android 9 Pie runs out of the box. It too has a water repelling design thanks to the P2i nano coating. Unlike the G7 Plus, there is only a single speaker that is placed on the bottom, but it is also tuned by Dolby. The USB Type-C port is also placed on the bottom. There is no NFC so for some users, this might be a major con. The Moto G7 comes in two colors – Ceramic Black & Clear White. The price is €250 for the European market and $300 for the North American market. It will be available in NA from March. The Moto G7 Power is a phone that is all about ‘dat battery’! 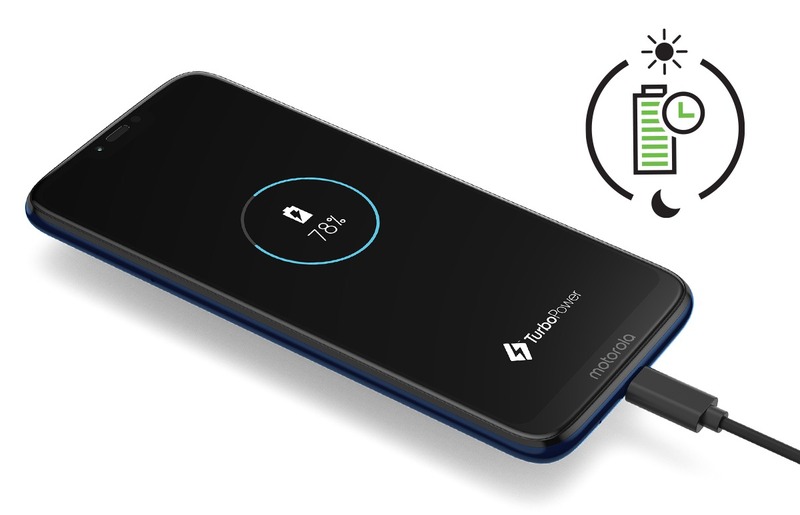 Housing a huge 5,000mAh battery underneath, this phone can easily last for more than a day. Moreover, there is 15W Turbocharging so charging time should not be a big issue. There are some compromises with the design, though. The Moto G7 Power doesn’t have a premium glass sandwich design like the G7 and G7 Plus. There is a plastic build, so the looks aren’t going to that great. There is a 6.2-inch HD+ display with a resolution of 1570×720 and an aspect ratio of 19:9. There is no waterdrop notch but instead a normal sized notch which is not too big as the one on Motorola One Power. Moreover, the display does have Gorilla Glass 3 protection. The processor powering the Moto G7 Power is the Qualcomm Snapdragon 632, i.e., the same chipset that powers the Moto G7. So, there are no compromises in terms of performance. There is 3GB RAM, and 32GB ROM & the storage is expandable up to 512GB via micro SD card. As we said, the Moto G7 Power is all about that huge 5,000mAh battery. There is a USB Type-C port as well which is rare for budget phones. Good job, Motorola! The Moto G7 Power has a single rear camera of 12MP with f/2.0 aperture, 1.25-micron pixel size, and PDAF. The rear camera can shoot 4k 30fps videos, and other features include Burst shot, Auto HDR, Timer, ZSL, High-res zoom, Cinemagraph, Portrait mode, Panorama, Manual mode, etc. There is video stabilization as well. On the front, the phone has an 8MP camera with f/2.2 aperture and 1.12um pixels. Some front camera features are Face beauty, Active photos, Cinemagraph, Portrait mode, etc. Just like the G7 and G7 Plus, the Moto G7 Power also has a water repellent design, thanks to the P2i nano coating. There is a single speaker on the bottom, and the phone doesn’t have NFC. The price is €210 for the European market and $250 for the North American market. Next month, the G7 Power will launch in markets like India as well. Finally, we have the Moto G7 Play which is the cheapest among the four. The G7 Play doesn’t have a mind-blowing battery or a great design or good camera hardware on paper. But, it does have the same Snapdragon 632 processor as the Moto G7 and G7 Power. Compared to the Snapdragon 430 processor on the last year’s Moto G6 Play, the Snapdragon 632 is a massive upgrade that, according to Motorola, results in 110% faster performance. Being the cheapest among the four, it also has the biggest notch which is similar to the one on Motorola One Power. The notch doesn’t have anything fancy in it except for the normal sensors, the earpiece, and the front camera. There is also a huge bottom chin with the Motorola branding. The Moto G7 Play has a 5.7-inch IPS LCD with a resolution of 1512×720 pixels and hence an aspect ratio of 19:9. The screen comes with the Gorilla Glass 3 Protection. As we mentioned above, there is a Snapdragon 632 processor which is an octa-core chipset clocked at 1.8GHz. The G7 Play comes with 2GB RAM & 32GB ROM, and the storage is expandable up to 128GB. There is a small 3,000mAh battery underneath that doesn’t support 10W rapid charging via the USB Type-C port on the bottom. So, it is great to see that all the phones in the Moto G7 family have USB Type-C port. Android 9 Pie runs out of the box. The Moto G7 Power has Water repellent design with P2i nano coating. There is a single 13MP rear camera with f/2.0 aperture, 1.12um pixels and LED flash. On the front, the phone has an 8MP f/2.2 camera with LED flash. The rear camera can shoot 4K 30fps videos. Portrait Mode is there for the front as well as the rear camera. Finally, the price of Moto G7 Play is €150 for the European market and $200 for North America. So, that’s all about the all-new Moto G7 Lineup that includes the Moto G7, Moto G7 Plus, Moto G7 Power and Moto G7 Play. What do you think of the pricing and the specifications? Do let us know via the comments section below.